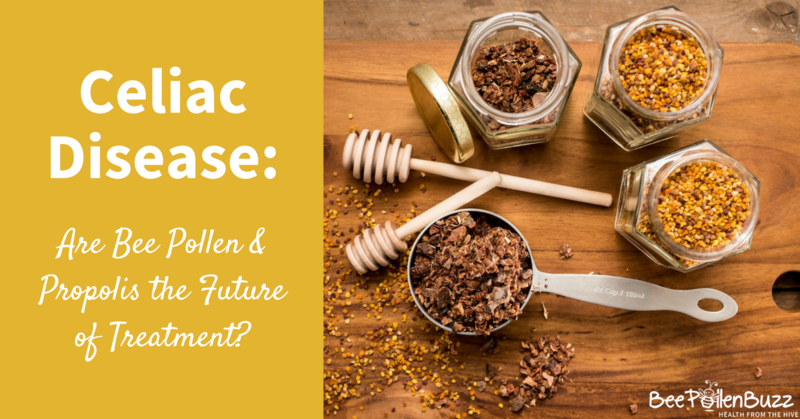 Could Bee Pollen and Propolis Bee the Future of Celiac Treatment? Many people hear about the dangers of gluten, but may not understand what gluten is and why -- or even if -- they should avoid it. Gluten consumption can be extremely dangerous and unpleasant for people who have a type of wheat intolerance known as celiac disease. At the current time, the only proven treatment is completely abstaining from gluten consumption. However, new research on bee products, especially propolis, are providing new hope. Consumption of bee products may inhibit celiac disease's inflammatory response, and prevent long term damage that is often caused by this condition. Celiac disease is an autoimmune disorder that affects one out of every 100 people. Another .4% of people have doctor diagnosed wheat allergies, where wheat causes an anaphylactic response. People who have celiac cannot process the protein, gluten, that is found in wheat and some other grains. According to celiac.org, someone who has a parent, sibling or child with celiac has a one in 10 chance of developing the disease themselves. People who have other autoimmune disorders are more likely to develop celiac disease. Symptoms of celiac disease include a range of gastrointestinal symptoms such as bloating, vomiting, diarrhea, constipation and pale, foul-smelling stool. People who have celiac will often experience weight loss, fatigue and irritability as a result of their condition. In children, celiac is often associated with delayed puberty, failure to thrive and attention deficit hyperactivity disorder (ADHD). The only proven treatment for celiac is the complete elimination of gluten from your diet. In some individuals, even small crumbs of wheat bread can lead to damage to the small intestine. Many of these complications are associated with the inflammatory response caused by celiac. When people with celiac are exposed to gluten-containing products, their immune systems attack the small intestine. When this happens, it results in damage to the villi, which are small, finger-like protrusions in the intestines that play a role in nutrient absorption. Most people who have celiac disease must avoid all exposure to gluten. This means complete abstention from wheat, barley, spelt and some other grains. Additionally, gluten can show up in products such as rolled oats when wheat flour is used in processing. Even the minute amounts of gluten that can get into a wheat-based beer can be enough to cause damage. Every exposure to wheat and gluten products can cause further damage. While careful avoidance of wheat products is key, it can also be valuable to explore treatments that reduce inflammation caused by accidental gluten product exposure. Can You be Gluten-Sensitive if You Don't Have Celiac? Celiac disease is diagnosed using a blood test and biopsy of the small intestine. People who have celiac will typically have results that show celiac disease antibodies. When those antibodies are present, your doctor will confirm the test results with a biopsy of tissue from the small intestine. However, there are a number of people who experience common celiac symptoms without ever having a positive blood test for celiac. These symptoms can include "brain fog," ADHD-symptoms, abdominal pain, bloating, headaches, joint or bone pain and chronic fatigue. These symptoms will often clear up when gluten is removed from their diet. There are currently no hard figures on how many people suffer from what is known as "non-celiac wheat sensitivity." For now, there is no treatment that allows people who have celiac to resume eating wheat. However, propolis, in preliminary studies, has shown promise in modulating inflammation that is associated with celiac disease. In one study performed on people in Algeria who suffered from celiac disease, individuals were given propolis in an ethanol extract. 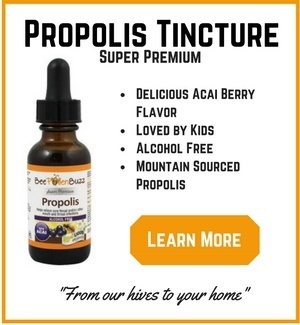 For example, a propolis tincture. After taking propolis, the patients showed lower levels of pro-inflammatory cytokines. These are simply markers of inflammation. If you are sensitive to a food and you consume it, your body often responds with inflammation. Over time this excessive inflammation leads to a host of health problems. Since inflammation is a factor in the long term damage caused by celiac, regular propolis consumption could help reduce the damage caused by gluten consumption. Research continues in this area; as we learn more, we'll be able to make better recommendations for health support from propolis. In the meantime, in the event that you consume gluten it might be a good idea to consume a propolis for several days after to help minimize the inflammatory response. While research on bee products and celiac disease is still developing, there is a growing body of knowledge regarding the power of bee products to fight inflammation and promote gut healing. 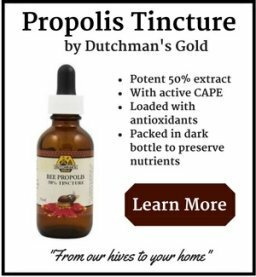 In 2013, the National Institutes of Health reported on a study on the use of propolis in rats who had the colitis, an inflammatory condition of the gastrointestinal tract. Those with celiac disease or gluten sensitivity often have colitis or other inflammatory bowel conditions. Rats in the study were fed a solution that included propolis. After seven to 14 days of treatment, the rats' colons were examined. Those who were given the propolis extract showed a reduced inflammatory response. This included lower levels of the abscesses and cysts that are associated with ulcerative colitis. 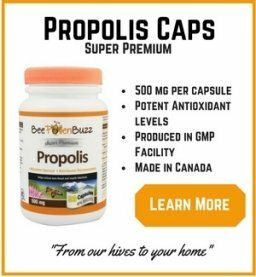 Propolis has long been known as a healing and anti-inflammatory substance. In a number of studies, people who had healing difficulties saw improvement when propolis was applied to wounds. 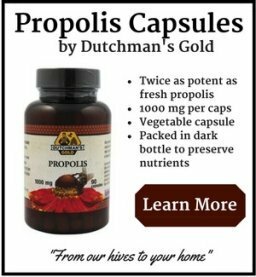 Propolis is also well-known for its anti-inflammatory action. Bee pollen is valuable for gut health, in part because of its high protein levels. Bee pollen, in fact, contains more protein than any other animal source. Conditions like celiac disease can lead to malnutrition because of absorption problems. Adding additional nutrients to the diet can help make up the balance. While studies on bee products and celiac continue to develop, it is valuable to continue your own research into the natural products that can support gut health. By examining items like bee products that can support a healthier immune system and a healthier digestive system, you can potentially avoid some of the long-term problems that can be associated with conditions like celiac disease.